One of the best parts about winter is that you have an excuse for eating heavy, hot, filling food, even if that excuse isn’t so appropriate anymore, what with reasonably efficient heating and 24-hour gyms and Uniqlo’s newest probably-snake-oil-but-possibly-just-kooky-and-Japanese insulation technology. But still! It’s great to eat soups and roasts and braises and chili and, I don’t know, lasagna, because it all tastes great and warming and filling. That said, sometimes eating warm and soft/liquid things constantly can feel a little leaden, and you long for the warm days of summer when you would eat crisp, fresh produce (do other people long for that? I long for that, like, constantly) and feel better about your life choices, if only for an hour. Luckily there are lots of ways to do that in the wintertime. One of the easiest is to eat a whole lot of citrus, because it’s in season. Vegetables might seem harder; the freshest vegetables in the winter are usually not prepared in a crisp, fresh way. The hardier brassicas, like kale and collards, are best when cooked low and slow to break down their fibers (I am aware that every restaurant in every city with a population above 20,000 serves a kale salad, and am further convinced that 99% of these are tough, fibrous, stringy, and unpleasant). Root vegetables and some squash varieties are either in season or store well through the winter, but are usually roasted. Ah, but what if we…don’t roast them? What if we eat them raw? Most root vegetables can be eaten raw, and have a very different flavor than they do when cooked: sometimes spicy, usually sweet, and always kind of cruciferous and herbaceous and fresh. Cooking tends to mellow out the flavors of any vegetable, which is sometimes necessary, but root vegetables like turnips and rutabaga are so mild to begin with that eating them raw is the best way to wrangle the most flavor out of them. One difference: when eating raw, you want the freshest, firmest, smallest ones you can find. Those enormous celeriac roots are fine for soup, but served raw they’re woody and tasteless. There are a few basic ways to prepare a raw root vegetable. They are uniformly very crunchy, so you don’t want big chunks or cubes, the way you’d want them for a roast. And the skin, unfortunately, is not always palatable. Your primary tools for dealing with winter vegetables are: a very sharp knife, and possibly a grater. Your knife needs to be extremely sharp for this task; dull knives are a lot more dangerous than sharp knives, because dull knives slip, especially off of moist vegetables. A peeler will work for some of these vegetables but not for others, and I prefer using a knife anyway; it’s a good way to practice your knife skills and I don’t really think it’s much slower. To peel, cut off the top and bottom of the vegetable, sit it down on its newly flat end, and kind of run your knife from top to bottom. Here’s a video, because it’s hard to describe (but easy to do!). As for a grater, the best option is an attachment for your food processor (it’ll be a disc, probably) or stand mixer. A box grater tends to make thin, flat strips, which are a little flimsy and can get soggy. I haven’t used too many of those dedicated shredders, but I have used this one, and it is awful awful: difficult to use, end product is inconsistent and there’s lots of waste. Carrot: You are probably familiar with the carrot. The peel is perfectly edible, though you’ll want to wash it well. One of the sweetest root vegetables, it’s often paired with other sweet things, like dried fruit, which I don’t really agree with. I think it’s better as the sweet component to more savory things, especially spices; ginger, cumin, and dried chile are my favorites. Beet: Really, really good raw. About the same texture as carrot, pretty light as far as root vegetables go and doesn’t require marinating (though you certainly can). The peel is not very palatable, so get it off with a sharp knife. All varieties of beet can be eaten raw, and all are prettier when raw than cooked (especially the candy-striped chioggia beet). Like carrots, beets are extremely sweet and pair well with dairy, herbs, and vinegars. Celeriac: One of the toughest and most intimidating of the root vegetables, celeriac is a variety of celery (not the root of your normal supermarket celery, but similar) cultivated for its root. It looks like it should be sitting on the shelf of a dusty apothecary. Cut off the entire gnarled bottom — don’t worry too much about waste, celeriac is really cheap — and then peel with a knife the same way you did the beet. Celeriac is a weird magic vegetable, with a distinct delicate celery-ish flavor that’s somehow sweeter and more aromatic than celery. Usually found raw in a classic French salad with mayonnaise. Kohlrabi: Looks like an alien pancreas. It’s in the brassica family, along with broccoli and cabbage and like pretty much every other vegetable, and tastes like it. Available in a few different colors but it’s sort of misleading because the skin is extremely fibrous and not very palatable. Peel the same way you would a beet or celeriac, but don’t discard the stems and leaves; the whole thing is edible and the stems and leaves are really good in a stir-fry. Tastes basically like broccoli stems. Sunchoke: Also known as the Jerusalem artichoke, this little guy looks kind of like ginger, but it’s actually a relative of the sunflower that’s native to the Northeast. One of the most flavorful roots on this list, it’s kind of nutty and very crisp, almost like an apple. It can cause farts, which is fun. One English farmer, upon coming to America, said: “which way soever they be dressed and eaten, they stir and cause a filthy loathsome stinking wind within the body, thereby causing the belly to be pained and tormented, and are a meat more fit for swine than men.” Haha! But also I don’t find them to be that farty. And they’re delicious. Turnip: One of my least favorite vegetables to roast but one of my favorites to serve raw. It’s somewhere between a radish and a carrot: sweet, mild, with a touch of spiciness. Goes well with cured meats and mustards. Winter squash: It’s rarely done and I have no idea why! Butternut squash is one of my least favorite vegetables when roasted, but raw, it has a fruit-level (I know it’s technically a fruit but you get what I mean) amount of sweetness, and a really nice crisp texture, though softer than the root vegetables on this list. Goes especially well with nuts and seeds, I think. Rutabaga: Like a turnip but tougher. I also have a hard time finding young, fresh rutabagas; usually they’re enormous mature ones, which are not very good raw. Parsnip: Honestly? Don’t bother. The parsnip is edible when raw but is starchy and flavorless unless you get the smallest, most delicate ones. Even then it tastes like a carrot that’s had the flavor vampired out of it. Potatoes/Sweet Potatoes: Potatoes are not actually related to sweet potatoes at all but my advice in this case is the same for both: do not eat raw. Both have various chemicals that make eating them raw unpleasant or even unhealthy. Shopping list: Beets, sunflower seeds (roasted), ricotta cheese (full fat), arugula, fresh lemon, olive oil, mustard, shallots. Chop a shallot finely and put in a little Tupperware container. Squeeze lemon over it to cover and let sit while you make the rest of the salad. Peel and slice a couple of beets into very thin rounds (a mandoline is helpful here) and slice those to form matchsticks. Toss with a handful or two of arugula. Mix about two tablespoons of sunflower seeds into an eighth of a cup of ricotta, adding salt and pepper to taste. Add a little squeeze of mustard into your lemon/shallot cup, then pour in some olive oil. Cover and shake vigorously to combine, tasting to make sure you have the right balance of lemon and oil, then pour over the arugula and beets and toss. Put onto a plate and kind of squeeze some of the sunflower/ricotta mixture into little clumps and scatter them across the salad. Shopping list: Carrots (multicolored if you can get them), sunchokes, turnips, avocado, pistachios, ginger (fresh or frozen), rice wine vinegar, brown sugar, chile paste. Shave all the root vegetables into thin strips. The best way to do this is with a mandoline, and because the mandoline is possibly the most dangerous tool in your kitchen, use either a hand-guard (the little plastic thing that came with your mandoline) or a kevlar glove, which costs 12 bucks on Amazon and basically makes you an X-Man. These will be different shapes, and that’s good, because these vegetables grow in different shapes and who are we to manhandle them into uniformity? The carrots will be long strips, the sunchokes will be short, the turnips will be rounds. Good. Shave a few of each thinly and put in a big bowl. Scatter in some pistachios. (Do I have to tell you to shell the pistachios? Shell the pistachios. You can’t eat pistachio shells.) Dice an avocado. Now make the vinaigrette: take your fresh or frozen knob of ginger, about the size of your thumb (frozen is easier for this) and, using a microplane, grate it into a Tupperware. Add in rice wine vinegar to cover, then some brown sugar, more than you think you need, and a small blob of chile paste (I use sambal oelek, usually). Cover and shake thoroughly to combine. Taste and see if it needs anything, adding more of the ingredients to balance. Throw vinaigrette into salad bowl and toss. Shopping list: Kohlrabi (any color), grapefruit, pretty orange (cara cara or blood), goat cheese, fresh mint, rice wine vinegar, walnut oil. 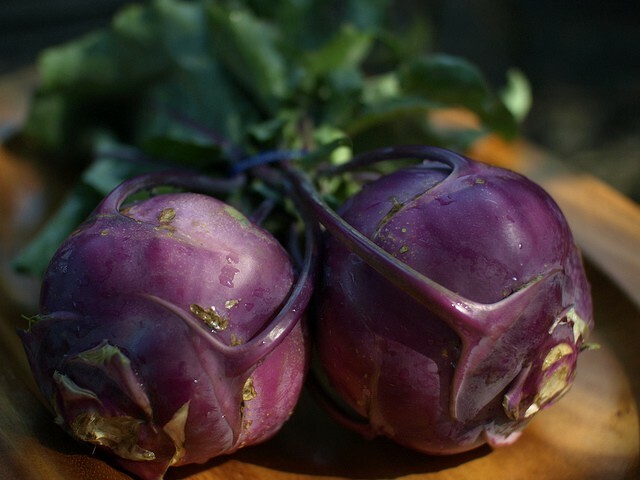 Peel and slice kohlrabi into thin rounds, then in half, forming half-moons. Supreme all the citrus (more info on how to do that here). Toss this all together in a bowl and crumble the goat cheese on top. Mix together rice wine vinegar with just a touch of the walnut oil; walnut oil is extremely strong and also will go rancid, so keep it in the fridge. Salt and pepper to taste, and let it sit for at least an hour, overnight would be better. Slice the mint into chiffonade: stack all the leaves of mint on top of each other, then roll it tightly like a sleeping bag. Slice thinly across the roll of mint leaves, forming very narrow strips. Scatter the mint onto the salad just before serving. I still tend to overload on soups and stews and roasts and bakes in the wintertime, and there’s nothing wrong with that! But sometimes you really just want something crisp and fresh, and all the cucumbers are watery and waxy, the tomatoes are from god knows where and taste like a tomato as imagined by someone who’s always hated tomatoes, the zucchini is squishy and the greens are all sprayed and bagged. Root vegetables are in season, at the peak of their flavor, and eating them raw can be a way to get the most out of them while at the same time soothing our hunger for real produce. Also when is summer again.